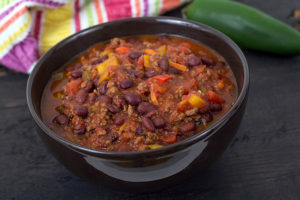 Chili doesn’t get much better than this spicy version with black beans. Cooked with tomatoes, the beans take on a beautiful mahogany color. Serve the chili plain or over boiled rice, and sprinkle with grated cheese if you like. Soak the beans in water to cover overnight. The next day, drain them and place in a large stockpot with the 4 cups of water. Add the bay leaf and simmer for 25 to 30 minutes, until the beans are tender but still slightly chewy. While the beans are simmering, slowly cook the onions, garlic, and red pepper in the oil for 12 to 15 minutes. Stir into the bean pot. Add the remaining ingredients, except for the grated cheese, and simmer, covered for 1 hour. Serve hot, sprinkled with cheese, if desired.